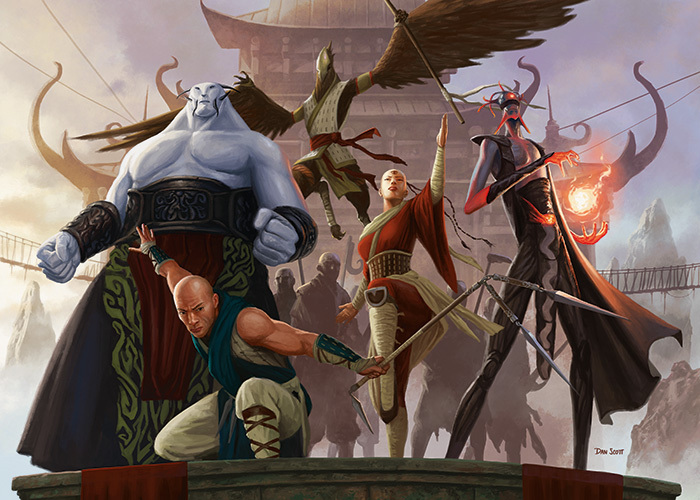 This is the first of two Planeswalker's Guide, which together are split into seven sections. Part 1 contains the introduction, Abzan, Jeskai, and Sultai. Dragons once thrived on the plane of Tarkir. They spawned from mighty elemental storms, filled the sky with their destructive breath, and terrorized the five ancient warrior clans. But the dragons met their fate long ago. For many years, the clans fought a war against the dragons for their own survival, hoping for some way to gain an advantage in the struggle. At a crucial turning point more than a thousand years ago, the dragon tempests stopped coming, and no new dragons were spawned. Their numbers thinned, and the tide of the war changed. Ultimately, the warriors of the clans were able to hunt down the last of the sky-beasts and destroy them. Dragons were rendered extinct on the plane, never to return. In the centuries that followed, the five warrior clans claimed dominion over Tarkir, growing and evolving into today's powerful clans. Led by the five khans, the clans clash with each other to this day, trampling the land in furious battles. Each khan seeks to win territory from the others—and some wish to rule it all. Although the clans drove the dragons to extinction, each clan still emulates an aspect of the dragons' nature. The resilient desert warriors of the Abzan clan are known for their endurance, exemplified by their armor made from the scales of fallen dragons. The Jeskai, monks and sages of lake-top monasteries, study the mystical arts and revere the dragons' cunning. The Sultai build luxurious palaces in the jungle murk, echoing the ruthlessness of dragonkind in their empire of undead servants. The fearsome riders of the Mardu crash across the highland wastes with the dragons' speed. And the shamans and survivalists of the Temur have conquered the perils of the icy wilderness by emulating the dragons' savagery. The dragons may be gone, but their memory lives on in each clan's culture, style of warfare, and magic. The Abzan emulate the endurance of the dragon and their symbol is the scale. They are a clan that understands that the world is a brutal place, and that to survive in it, they must be able to rely on and trust the people around them. Duty and family have consequently become the mainstays of Abzan society. So has the resolve to destroy those who would destroy them. The Abzan see themselves as the millstone, moving slowly, always with purpose, crushing all before them. Abzan culture is built around surviving the hardship of living in the arid, rocky desert. Family. Above all, the Abzan value family. Family is the institution that has allowed them to persist and even thrive. The level of trust that members of the clan have for one another is typically linked to closeness of blood. Betrayals of such trust can result in a ritual disowning, where both parties shed blood into a fire. By contrast, if a clan member refers to another clan member as sister or brother, it is a mark of high esteem. Trust of ainok. 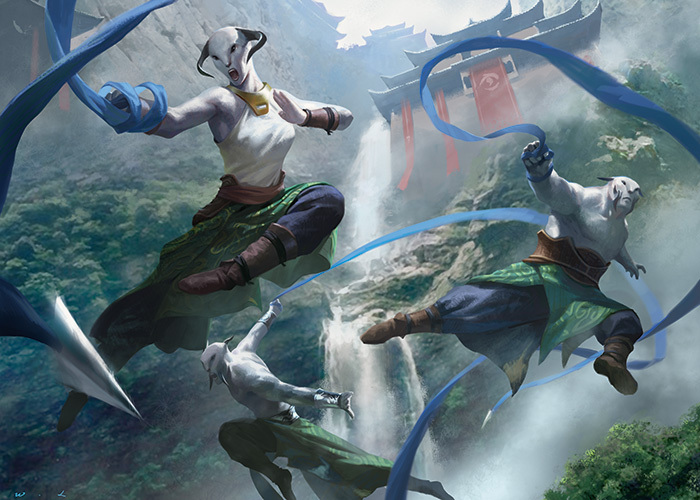 The Abzan have become very insular and distrusting of those outside the clan. The only exception to this general rule is the status of ainok, a race of canid humanoids. It has been many generations since the ainok nomads helped the Abzan survive. They are still tolerated in Abzan cities, although they typically live on the fringes of the human-dominated society. Family tree and ancestral spirits. Due to the scarcity of resources even in the oases, each Abzan family is responsible for caring for a particular fruit-bearing tree, called a kin tree. The firstborn child becomes a tree warden, or caretaker, while the other children may become soldiers, merchants, or artisans, and will plant trees of their own with the seeds of their parents' tree when they start families. When family members die, they are laid to rest beneath their family tree without a casket. Their bodies provide nutrients for the tree, which in turn bear fruit for future generations. Instead of headstones, family names are carved directly into the kin tree. This concept reflects the Abzan ideal of duty to the family. In fact, the spirits of the dead are closely connected to their trees, and can be called upon in times of war. War strategists. The Abzan are known as adept war strategists. They believe that most of a battle is fought before the armies engage in the field. Disciplined soldiers, high walls, and ample supplies will win the day. 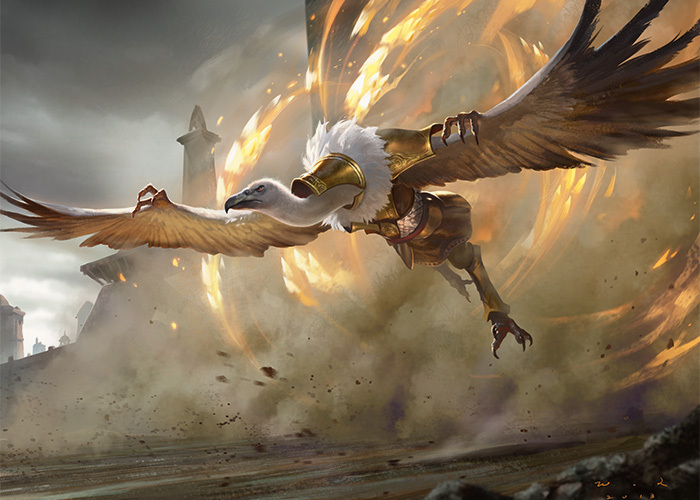 The Abzan value the ability to choose the site of a battle to optimize their strengths, and will often forego pursuit of the enemy after victory in favor of holding strategic ground. However, they have learned to turn losing situations to their advantage and are known for using the harsh desert terrain as a weapon. Many Abzan generals have led an enemy army into the Shifting Wastes, where the desert ultimately claimed victory. The Abzan clan is made up of a web of interconnected families, each of which is ruled by its oldest member. 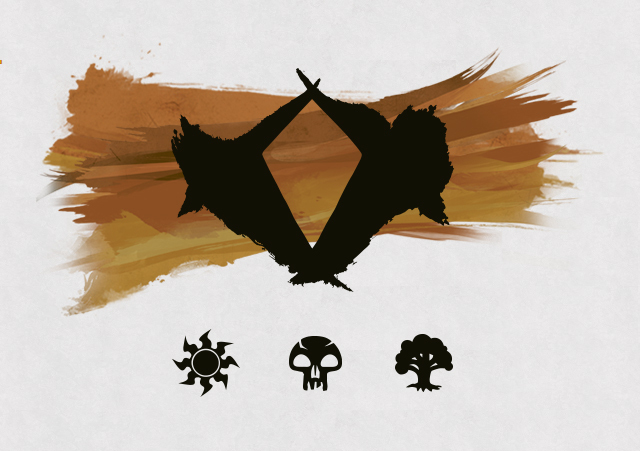 To an outsider, the clan may look like a unified entity. 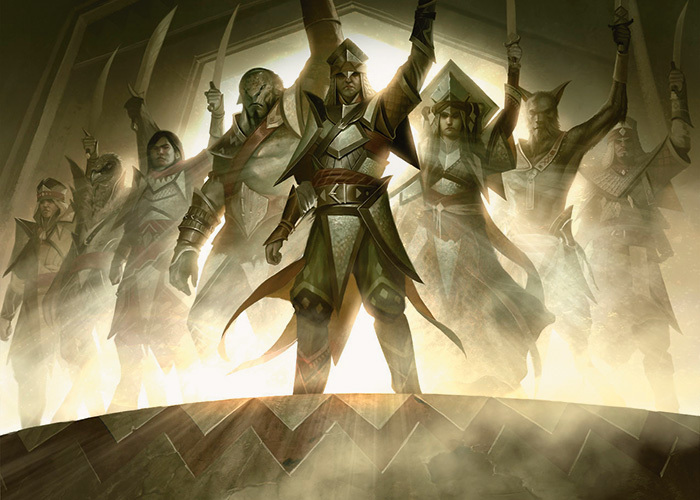 In reality, the organization of the Abzan is dynamic, with families maneuvering politically to form bonds with some families while trying to isolate others. That being said, the Abzan are all too aware that disunity can allow them to fall prey to other clans. They select a khan to organize the clan's defenses and lead the army in times of war. Each family is responsible for providing soldiers for the greater Abzan army. Blood-Kin. Family members who are directly related by blood, no matter how distantly. Bond-Kin. Family members linked by oaths ("You are like a sister to me"). Krumar (see below) fall into this category. Clan orphans. Abzan members who have no family but are still part of the clan. Orphans can be adopted by families. Disowned. These are individuals who have been ritually disowned. By law, they cannot be adopted. There are colonies of disowned outside Abzan settlements. Some disowned become wanderers, adventurers, or mercenaries. Krumar. As the Abzan wage war, they create many orphans among their enemies. 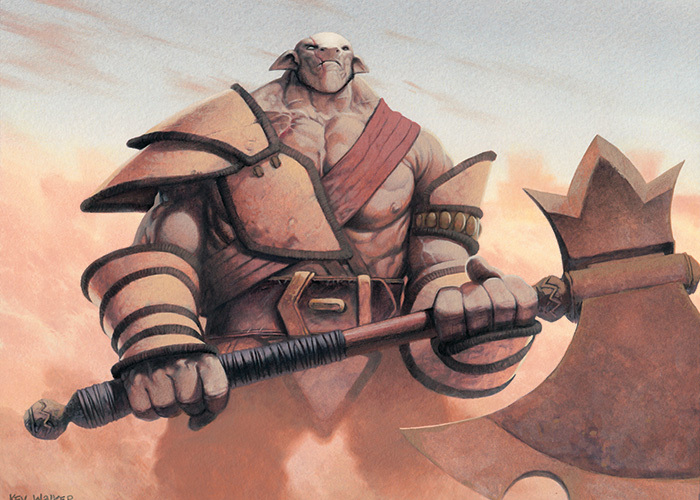 Krumar are the orphaned children of enemy clans taken by the Abzan to be raised as soldiers. The taking of krumar is a tradition that dates back to the days when the Abzan were raiders, and it remains a strong institution to this day. Krumar taken by an Abzan must by law be treated as bond-kin, and many krumar have been adopted by the families they are bound to protect. Many orcs have joined the Abzan as krumar. Spirit speaking. 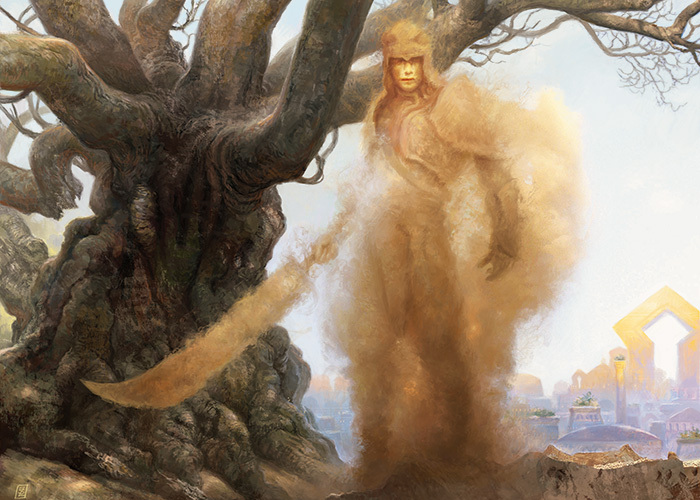 Abzan human magic revolves around ancestor worship, which is connected to the Abzan reverence for trees. Each family kin tree is a hub for its ancestors' spirits. 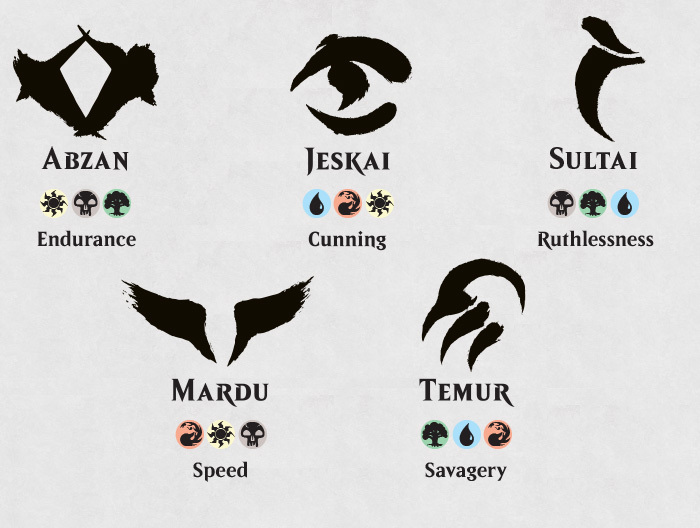 Some among the Abzan have learned to communicate with these spirits, and even call them forth to either protect their descendants or harm their enemies. The Abzan have discovered that amber, tree resin, and sap aid in spirit magic. Amber wards are found in Abzan homes and Abzan soldiers carry amber with them to war. Spirit speakers consume distilled tree resin to help them connect to spirits. Weapons made from the wood of fallen kin trees are said to be blessed. Malevolent spirits. When disowned Abzan die, their spirits have no place to go. Some Abzan mages seek out these lost spirits. This is a taxing feat because these spirits are vengeful and malicious. 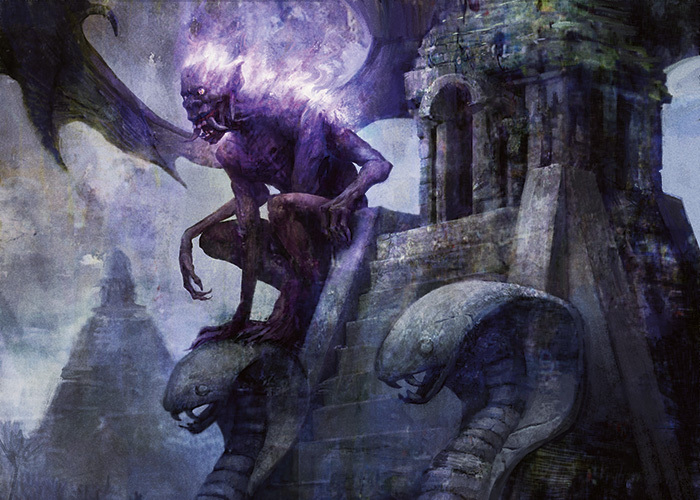 However, in times of war, the malevolent spirits are channeled by Abzan mages to be unleashed against the enemy. Ainok sandcalling. 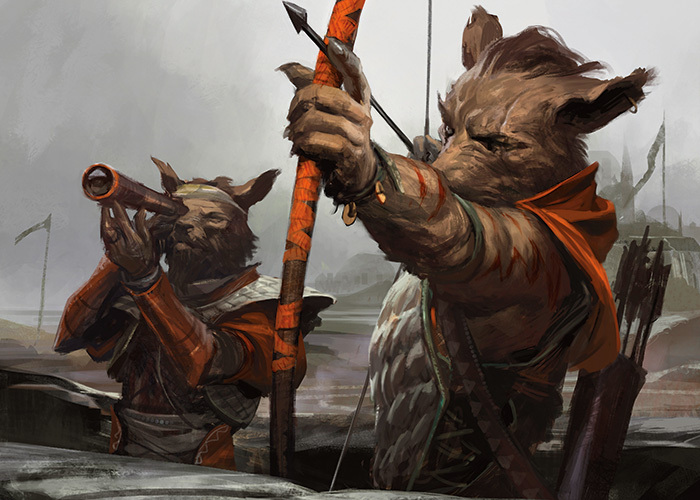 The Abzan includes members of the canine race known as the ainok. The ainok of the Abzan Houses are deeply connected to the desert. They can always find their way to water, and they rarely become disoriented in the ever-changing landscape of the Shifting Wastes. In fact, some ainok have mastery over the sand itself. These sand shamans excel at obscuring their movements, scouring their enemies with sandstorms, or simply getting their enemies hopelessly lost. Some humans have been taught this magic, relying on the instruction of their ainok kin. Dragonscale are heavy infantry who make up the bulk of the Abzan army. These are troop levies pulled from Abzan families. They carry dragonscale shields. Ibex cavalry are the heavy cavalry, or cataphracts, of the Abzan. They wield both lance and bow, and they ride on war ibexes. Krumar orcs were taken from orc families and raised to be house guards for the Abzan. They are treated as family, and many orc families live in Abzan settlements. In times of war, they serve as shock troops. Scouts are adept information gatherers and are often deployed to harass enemy troop movements. Tree wardens are perhaps the most skilled warriors. It is their singular task to protect their family's kin tree at all costs. Spirit speakers summon and channel ancestral spirits. 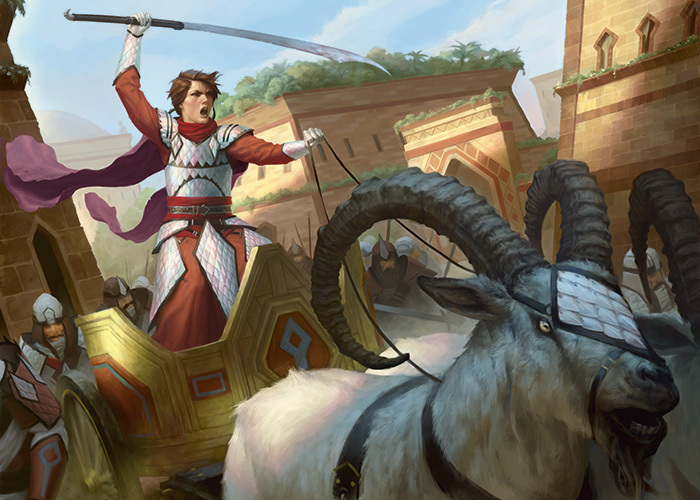 Anafenza, the khan of the Abzan, rides into battle atop a heavy chariot pulled by her two prized ibex. She directs battle from the front lines, her soldiers always able to see her leading the charge, and her elite guard of aven warriors always at her side. Anafenza rules from Mer-Ek Fortress, which protects the city of Arashin at the heart of Abzan territory. She wages war not to conquer, but to maintain the trade routes that allow her clan to function, and to protect her people and her land from the encroaching Sultai and Mardu war parties. "We do not pile the skulls of our enemies, nor make them into ornaments. We grind them into dust. We leave nothing for their families to weep over, nothing for their descendants to honor." Gvar Barzeel is the commander of the krumar, and there is no orc more respected among the Abzan. He leads the krumar in battle, and he is always found where the fighting is fiercest. He is shorter than most orcs, but stout. He wields the mighty Axe of Ancients, a gift given to him by the family he was bound to on the day they formally adopted him. He can trace his roots to the Mardu, but he is proud of his adopted clan. Gvar Barzeel believes the Mardu to be savages, and he knows his destiny is to one day meet Zurgo, the orc khan of the Mardu, on the battlefield. The First Tree and the Amber Throne. The First Tree is a sacred tree to the Abzan, believed by many to be the tree planted when the clan was founded. The Abzan have brought the First Tree from capital to capital throughout the ages, and now it is planted on the hilltop protected by Mer-Ek Fortress. The Plaza of the First Tree was built around its namesake, and this is where the khan of the clan holds court. The First Tree has grown so large that it shades the entire plaza, giving the impression of being indoors. At the base of the tree is the Amber Throne, made entirely from resin of the First Tree. This is the seat of the khan. Mer-Ek Fortress and the city of Arashin. Arashin is the hub of the Abzan clan. The trade routes that wind through the Shifting Wastes all pass through it, bringing wealth from across Abzan territory and beyond. Arashin sits atop a rocky hill that juts up from the desert sand. Arashin is the home of the First Tree and the khan. While not the largest city of the Abzan, it serves as the clan's symbolic and administrative center. The city is hemmed in and protected by the colossal sandstone walls of Mer-Ek Fortress. Sandsteppe Gateway. Close to the border of Mardu territory, where the desert gives way to the rolling steppe, sits the great Sandsteppe Gateway. It is a fortress bridge spanning the gap between two mountains that are divided by a river, which flows out from Abzan lands. The Lookout Roost. There is an expanse of parched, cracked earth between the more populated Abzan lands and the mountains that mark the border with the Sultai. In this utterly desolate place, the Abzan built a watchtower known as the Lookout Roost. It rises four hundred feet into the air, and it is built of a reddish stone. From a distance, it has the appearance of a giant bronze spike driven into the earth. 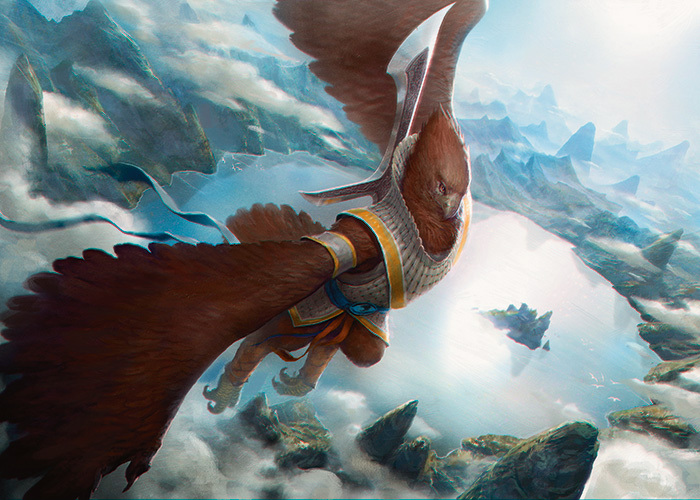 Vulture-aven who have sworn allegiance to Anafenza and the Abzan have been given the Roost to watch over. 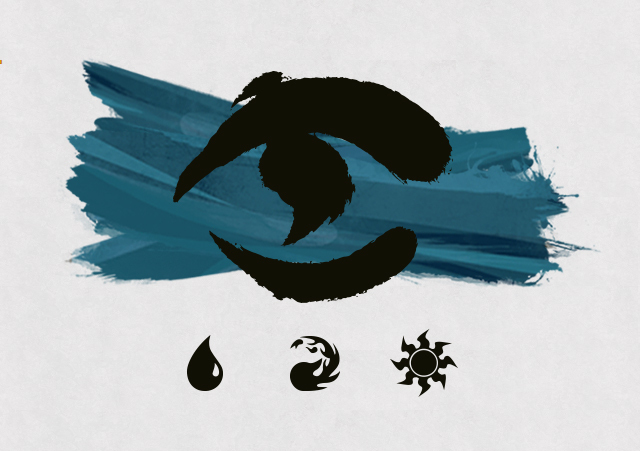 The Jeskai emulate the cunning of the dragon and their symbol is the eye. The people of this clan are martial artists, mystics, and wandering warriors. To the Jeskai, discovery and enlightenment are the ultimate goals. Members of the clan direct their energies toward learning and "ascending" to ever greater levels of accomplishment. Rigorous training for body and mind begins at an early age and is continued throughout a person's life. The clan has a strong sense of tradition, honor, and respect. Cunning and strategy in combat are highly revered by the Jeskai, who are associated with the dragon's eye. 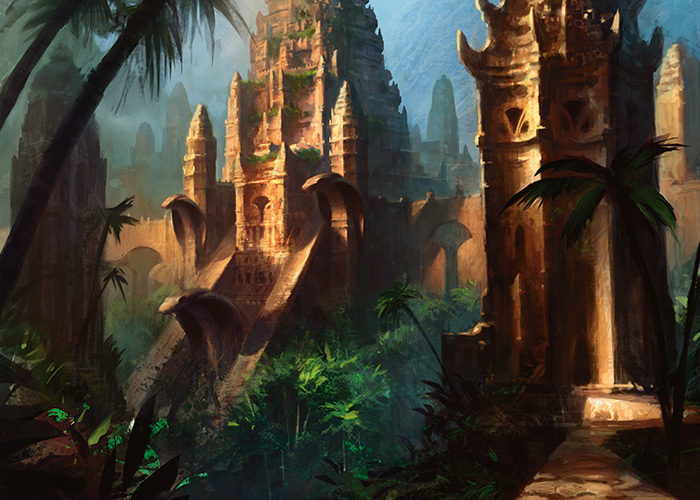 Instead of a central city or seat of power, Jeskai culture is based around a series of isolated strongholds. These strongholds maintain their own rituals and schools of thought, but they are affiliated through Jeskai traditions and values. Outsiders may join the clan if they can demonstrate a commitment to its rigors. Age is a mark of honor, and elders are revered. The four pillars of the Jeskai Way are discipline, enlightenment, industriousness, and traditionalism. 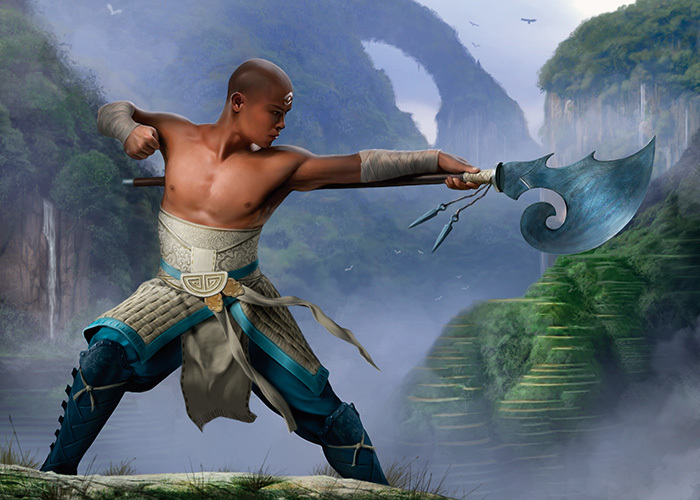 Discipline: The Jeskai devote themselves to martial arts and skills with weapons. Every person, whether farmer, fisher, or monk, has a weapon of choice. Study and practice with this weapon continue throughout a person's life. A day without training is a wasted day according to the Jeskai. In addition to weapons training, the members of this clan devote several hours a day to physical meditation, resembling combat forms practiced in slow motion. This can be a mystical ritual, and Jeskai mages combine this practice with spells, but mysticism isn't required. Even for people who command no magic at all, this physical meditation slows down the aging process. The average Jeskai's life span is more than double that of other clans. Initiate's Stair. This stairway is carved into the face of a white-rock pinnacle that reaches high into the air. The stairs wind around the pinnacle, all the way up to the top, where there is a simple shrine and an unparalleled vista. Climbing this stair is considered a rite of passage for Jeskai youth. The climb is not difficult—except they must climb the stair on their hands. It takes incredible stamina, strength, and balance to accomplish this feat and ascend all 1,578 steps without falling. Jeskai children spend years in preparation, which begins as early as four years of age. Those who have climbed the steps are considered adults. Weapon skill. The Jeskai study and craft many varieties of weapons: sticks, staves, daggers, butterfly knives, metal claws, swords, fork-tipped swords, ribbons, and flails. The Jeskai aven also use long narrow nets as weapons, which they use to incapacitate and relocate their enemies rather than kill them. Enlightenment: The Jeskai see themselves as more enlightened than the other clans. They believe they alone understand the true nature of the world and therefore are the only true arbiters of justice. The Jeskai believe they can follow more than one path to enlightenment, and each stronghold has its own ideas about which path is best. Enlightenment is not considered an end state, and when asked what enlightenment is, a Jeskai monk might merely answer with a cryptic response such as, "Enlightenment is contemplation of that which cannot be contemplated." Curiosity and discovery are seen as essential elements to attaining wisdom. No matter what path a person takes, he or she is expected to attain wisdom and metaphysical tools, including the command of all the "fires," which are the elemental forces of the world. Bloodfire. To the Jeskai, bloodfire is the most important of the elemental fires. They believe that during combat, a fighter must let go of logic and compassion and be consumed by bloodfire. In this state, rage is considered a righteous act. It is only through many years of training and discipline that a fighter can attain mastery of the bloodfire. Many Jeskai believe that bloodfire evokes a "superhuman" state, in which the person is invincible to weapons or other attacks. Compassion. The Jeskai value honor and often come to the aid of the oppressed and poor. They are quick to judge—and kill—those they see as oppressors or bullies. To the Jeskai, compassion is not innate. It must be learned through study, discipline, and experience. Ultimately, compassion should supersede the base instincts of the self. The Stone's Throw. The revered monk and ancient khan Shu Yun threw a stone into a thousand bodies of water—lakes, rivers, and seas. Legend has it that he waited by the shore of each until the ripples died away, and then the water gave him its wisdom. This is just one example of a person's path to enlightenment. There are thousands of stories such as these in the Jeskai. Each person's path to enlightenment is unique and individualistic, and the scholars of the strongholds write these stories on enchanted scrolls to keep for all eternity. Industriousness: The Jeskai abhor ostentatious displays of wealth and hedonism. Their strongholds are austere and practical. Because of their long life spans, artisans spend years in apprenticeships before becoming masters at their trade. Their crafts are colorful and deceptively simplistic; the techniques behind them are flawless. The Jeskai have developed ingenious waterwheel technology, which produces power and carries fresh water to even the most remote mountaintop stronghold. Artisans craft sextants and other fine metalwork, but only in small quantities. The Exquisite Hand. Artisans reside in the Sage-Eye Stronghold. Each makes one craft per season—a tapestry, a handcarved flute, a painting on a scroll. Everything they do is exquisite and fetches the highest prices in far-flung cities. Waterways. 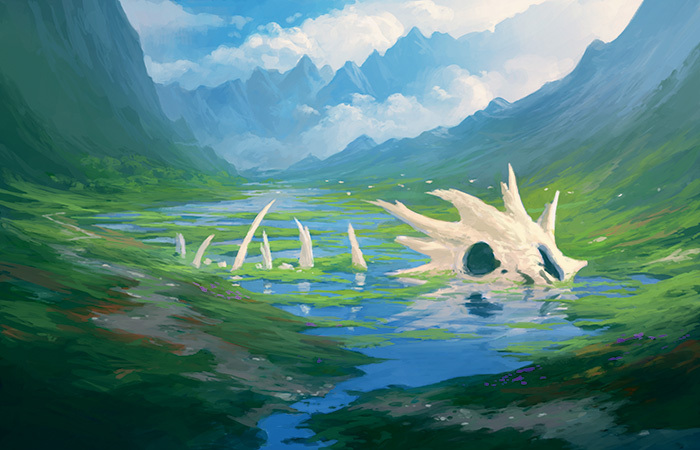 Other than the villages attached to strongholds, virtually all Jeskai villages lay along Tarkir's waterways. Huge waterwheels capture the energy of the flowing rivers and are used in the clan's industrious ventures. Traditionalism: Each stronghold has its own secret manuals and traditions on how to reach the highest "levels" of enlightenment. Dozens of unique schools exist, some that emulate the aven, while others focus on legends of the ancient dragons. While there are many disciplines, each takes a lifetime to learn, so many Jeskai follow a single path. The Jeskai believe that everyone—even common artisans—should experience rigor and hardship to gain access to mystical knowledge and physical mastery. Annals of the Sage Eye. These are the records, which stretch back hundreds of years, kept by the khan of the Jeskai. Only the leader of the Jeskai, currently a woman named Narset, is permitted to read the Annals. The Annals describe the ancient times and the decline of the dragons. They hold the secrets of countless spells and rituals that have been known only to a handful of people throughout the ages. School of Pearls. This is a martial arts tradition whose adherents are called pearl fighters. They are wanderers who arbitrate conflicts between villagers. Their style involves light-footed combat and a strict code of law. During battle, pearl fighters conjure and manipulate thousands of pearls. Pearl fighters can use these pearls both offensively and defensively. They can send thousands through the air like a wave, or ensnare their enemy in a great cloud. After a great battle between pearl fighters and a band of outlaws, the ground was blanketed with so many pearls that it looked like snow had fallen. Children gathered the incandescent remnants hoping to sell them, but they evaporated hours after the battle. Kaisham Wanderers. This tricksters' school reveres "laughing play," or pranks against outsiders. These pranks are intended to make people question their beliefs or learn to enjoy the absurdity of life. This school maintains no stronghold; instead, it holds regular gatherings in the wilderness. Kaisham move in small bands of mentors and students, and often beg for their livelihood. Unfortunately, violence against these tricksters by outsiders is common. Bandits will often target them for sport. Some Wanderers engage in acts of kindness, but refuse to take credit or be recognized for these gifts. Many Jeskai efreet become members of this school. They tend to travel only with other efreet and become tricksters. The Jeskai efreet have the reputation for taking their pranks too far. Several efreet have engaged in pranks with a sinister, almost cruel, tone, and were cast out of the Jeskai by Narset. The Jeskai clan is a combination of nomadic wanderers, who move with the currents of the water, and settled populations, which are centered at the strongholds or as villages along the waterways. Many of the strongholds contain villages within their walls, and the mystics and scholars of the strongholds tend to remain in one location their entire lives. While these are the safest, most secure villages for the clan, most Jeskai are River People, living at the water's edge. Small family bands may spend part of the year travelling with a village, but set off on their own at various times. Independence is a characteristic of the Jeskai people. Strongholds and minor holds. The Jeskai recognize four main strongholds, which are ancient and inaccessible. They each house a venerable school, with its own traditions and beliefs on enlightenment. There are many smaller holds, which more recently built and easier to reach. Some of the minor holds have schools associated with them, but they are usually branches of the main strongholds. The minor holds are built along recognizable routes, and travelers can walk between them in a day or two and expect to have hot meals and roofs over their heads. Sometimes, non-Jeskai attempt to set up a hold in Jeskai territory and are quickly rousted by the Wandering Warriors. Governance. Although Narset is recognized at the khan of the Jeskai, each stronghold and minor hold governs itself in its daily affairs. Narset is recognized as the authority in matters of war and diplomacy. But for daily business, the Jeskai obey the Rules of the Reeds, which is a simple code of how to treat their fellow clan members. These rules include a presumption of innocence for the accused, a right to arbitration over disputes, and a trial for Jeskai who are accused of murder. Jeskai do not trust outsiders to obey the clan's rules of fair play and honor. When a Jeskai deals with another Jeskai, they expect to be treated according to the Rules of the Reeds and trust that the Wandering Warriors will defend their interests if something goes amiss. Ways. There are three major "ways" in the Jeskai tradition. When a student reaches adolescence, the youth can choose from three paths: "artisan," "mystic," or "wandering warrior." While most students are born into the clan, it is not unheard of for a Temur youth or an orphan from another clan to be educated by the Jeskai. Way of the Artisan. Jeskai children who choose this path finish their education by learning a trade. The Jeskai are renowned for making weapons of all kinds and out of all materials, and every trade includes a component of weapon-making. Blacksmiths make kettles and swords. Weavers make blankets and braided whips. Carpenters carve wooden chests and arrows. There are artisan brigades that build watermills, boats, and other works for the Jeskai people. Many of the strongholds contribute funds for boat-builders to make and donate solid vessels for growing Jeskai families. Way of the Mystic. These students continue their studies in the arcane and martial arts and will eventually become scholars, teachers, and monks in a stronghold. Way of the Wandering Warrior. These students apprentice with an elder wanderer and spend increasing amounts of time in the wilderness, where they serve as scouts, spies, and nomadic arbiters of justice. Sage-Eye Stronghold: The main stronghold and nexus of the Jeskai clan is built into the side of a mountain at the edge of a bay. The bay is ringed by mountains, and the stronghold is only accessible by ship—or by people with excellent climbing skills. The adherents of the martial arts tradition followed here are known for their stealth, quickness, and cunning. Dirgur Stronghold: This stronghold, built on an island in the midst of a vast lake, is surrounded by a floating village with a network of wooden bridges. Natural pinnacles of rock (and dragon ribs) jut out of the lake and serve as anchors for the bridges. This is the most accessible of the main strongholds, sitting near the crossroads of a major caravan route known as the Salt Road, where the Jeskai trade somewhat peacefully with Abzan merchants. The Dirgur martial arts tradition is aggressive. Its adherents are known for their skill with bladed weapons. The fiercest warriors of this tradition focus on elemental magic and become bloodfire warriors. Cori Mountain Stronghold: This massive stronghold is constructed inside an ancient flooded caldera. An immense and well-preserved dragon skeleton surrounds the stronghold like a perimeter fence. The symbol of the stronghold is a dragon, and its martial-arts tradition is based around the movements of a dragon. It's rumored that the soul of a dragon is contained in a mystical vessel buried deep beneath Cori Mountain. Riverwheel Stronghold: This white-walled fortress is built into the side of a cliff. A huge waterfall flows through the central fortress. Wooden wheels are suspended between the towers to catch the water of the waterfall as it flows through the heart of the fortress itself. The Riverwheel martial arts tradition imitates the flow of water and uses flexible weapons like whips, long blades, or cloth. Routes and roads. Wandering is held in high esteem by the curious Jeskai. There are routes through Jeskai territory known only to the Jeskai and can be easily overlooked by people who are unfamiliar with their existence. The Jeskai routes are usually the safest ways through the mountains and along the complex waterways. Many of the routes have old enchantments on them and are invisible to non-mages. Aven mages are said to be able to see them from the air, and some of the routes form aerial pictures (these are seldom the quickest way between two points). Both the routes and the pictures they form have special meanings, which are recorded in the Annals of the Sage Eye as well as the secret books of other schools and strongholds. But the meanings are even less well known than the routes themselves. Trail of Dead Emperors. A route through the mountains marked by towering white standing stones. The Dead Reckoning. A route through a treacherous swampy region with a reputation for fatalities. Salt Road. Part of a larger road that stretches through many of the clans' territories. The section that crosses Jeskai territory contains the clan's largest trading post, where many of their weapons are bought and sold by outsiders. The trading post is called Purugir and is located in a canyon under an overhanging rock where the rain never touches it. The Abzan also use the Salt Road, sometimes leading the Jeskai into conflict with that clan. On a practical level, the Jeskai use concealment magic to achieve an element of surprise—cloak their movements; disguise their identity; scout foreign lands; and ambush their enemies. On a metaphysical level, the Jeskai revere the elemental forces, or fires: soulfire (white), mistfire (blue), deathfire (black), bloodfire (red), and vitalfire (green). While the Jeskai recognize that deathfire and vitalfire exist, they are not considered part of the Jeskai tradition. According to Jeskai beliefs, death magic is an abomination and should be avoided at all costs. Vitalfire is considered off limits—it's a component of nature that is mindless and independent and should not be manipulated. There are many aspects to Jeskai elemental magic, including summoning elementals, temporal and spatial distortion, healing, protection, and combat advantage. A person who masters the three Jeskai fires has attained enough wisdom to explore the next level of existence and harness the sixth fire: ghostfire. Only a few people have ever learned to control ghostfire, and it is believed they are able transcend natural elements and alter their fundamental nature and existence. Windscout. This is a common role for the aven of the Jeskai. Typically, the aven members of the clan live in their own isolated settlements in the remote highlands. Some who have chosen the mystic path dwell in the towers and lofts of the strongholds. Narset has a close relationship with the aven of Sage Eye, and she sends them on regular scouting missions to other clans. Over time, the Sage Eye aven have built relationships and become emissaries between the Jeskai and other clans. Bloodfire Warriors. Some schools focus on the art of manipulating the elements. In particular, the Dirgur School teaches students how to create and wield the powers of the fires and summon elemental soldiers. 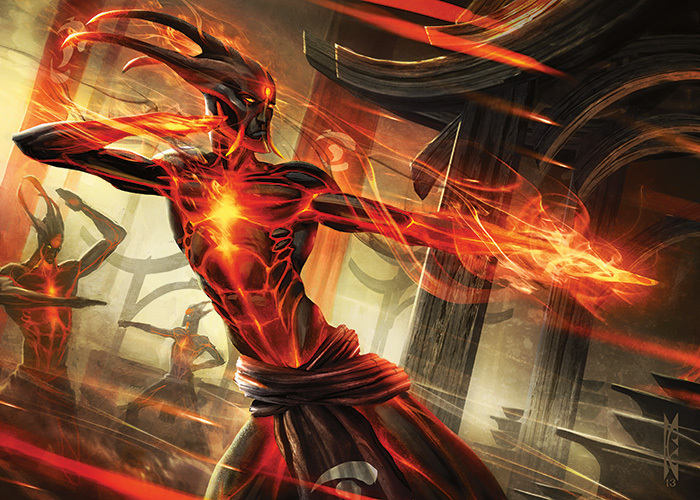 The bloodfire warriors are the most feared—and bloodthirsty—of the Jeskai warriors. Wandering Enforcers. Some of the wanderers take roles as village enforcers. They are paid to protect the populace from bandits or unfair treatment from the other settlements. These are usually short-term arrangements, for few Jeskai wanderers stay in one place for long. Mystics of the Infinite. Humans in the strongholds often turn to meditation. Sometimes, sessions last years and end with the mystic knowing powerful battle magic. Mystic is another role for the aven of Jeskai. Some live as hermits for years in the mountains, flying in intricate patterns around the peaks as a form of meditation until they gain enlightenment, which invariably makes them more powerful fighters. There is a saying among the Jeskai: "If you want to win a war, follow the mystic." Narset is the khan of the Jeskai. A martial arts master, scholar, and mystic, Narset has cultivated mental discipline and can accomplish astonishing physical feats. She spent her youth wandering, honing her fighting skills in the wilds. Her travels deliberately took her through the lands of the other clans, and she studied their cultures with a curious eye. Her practical knowledge of outsiders is unlike that of most Jeskai scholars, and this benefits her as a leader. As the khan of the Jeskai, Narset is vigilant about her people's safety. She guides her clan from Sage Eye Stronghold, the nexus of the Jeskai. Some say that Narset possesses a secret potential inside her, a power or calling that will drive her to a greater purpose, but she remains dedicated to leading her clan. "True understanding of the universe comes from understanding of the self. Pretension and malice obscure that understanding, so we must strive to banish them from ourselves and from the world." The Efreet. The homeland of the efreet is outside Jeskai territory in an inaccessible mountain range called Qadat, the Fire Rim. Unlike most Jeskai, efreet are never born into the clan. Instead, they make the choice to leave their home region and come to Jeskai territory once they are reach adulthood. Efreet who choose to embrace the Jeskai Way are outcasts from their own kind and are no longer welcome in the Fire Rim. 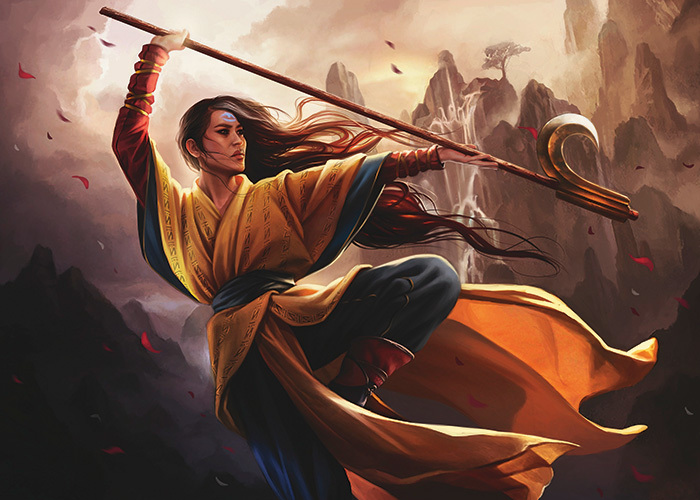 By becoming Jeskai, an efreet is embracing a life of martial discipline over all else. They will not talk about their former lives, which is why Qadat continues to be shrouded in mystery. Jeskai scholars maintain that efreet are drawn to the Jeskai for the concept of bloodfire, but they believe the discipline necessary to attain it is completely outside their nature. According to these scholars, efreet must set aside their inherently destructive nature before they can truly seek enlightenment. The Jeskai efreet are exceptional warriors and battle mages. In the occasional battles with other clans, they are often in the vanguard of the attack. There have always been efreet who embrace the Jeskai Way, but in recent years, their numbers have been increasing. In the past, most Jeskai efreet gravitated toward the trickster school. That seems to be changing, now that Narset has efreet in her personal guards, and efreet are seen frequently in the Sage_Eye Stronghold. Mantis. 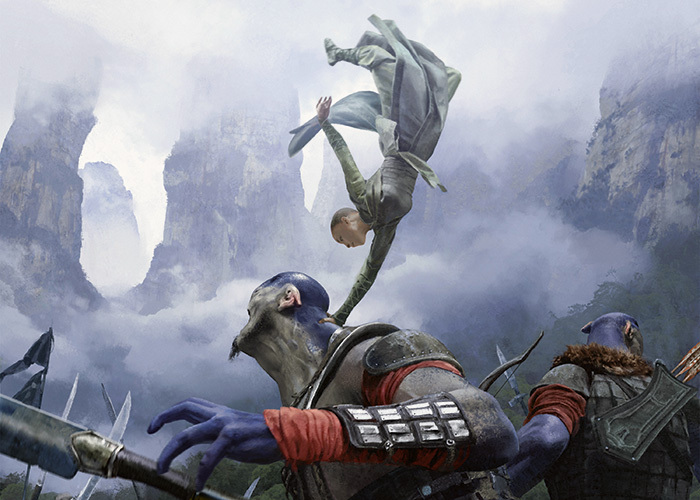 At the isolated Highspire Stronghold, monks are trained to ride and control wild mantis native to the mountain peaks near Jeskai territory. Mantis riders know their mounts owe them no allegiance. Even a mantis ridden for years would consume a rider who loses focus for only a moment. The Sultai emulate the ruthlessness of the dragon; the fang is their symbol. In the past, Sultai grew wealthy and powerful by exploitation of the people and the resources of the land. Their main source of power is necromancy. The Sultai control a vast workforce of tireless undead, known as sibsig, to mine, farm, and dredge the seas and riverbeds for food and dragon bone. Tarkir is a world of battle, and the Sultai have no end of fresh dead to resupply their army. This makes attacking the Sultai a demoralizing undertaking. 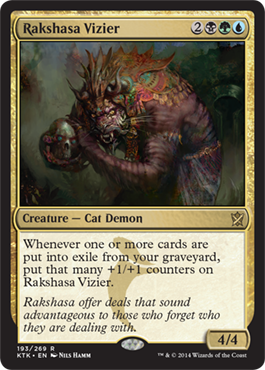 The Sultai were the first clan to make deals with the powerful rakshasas, ruthless cat-demons who offer great power at a terrible price. The Sultai soon became adept at deadlier forms of magic, and their willingness to use their magic made them even more formidable. 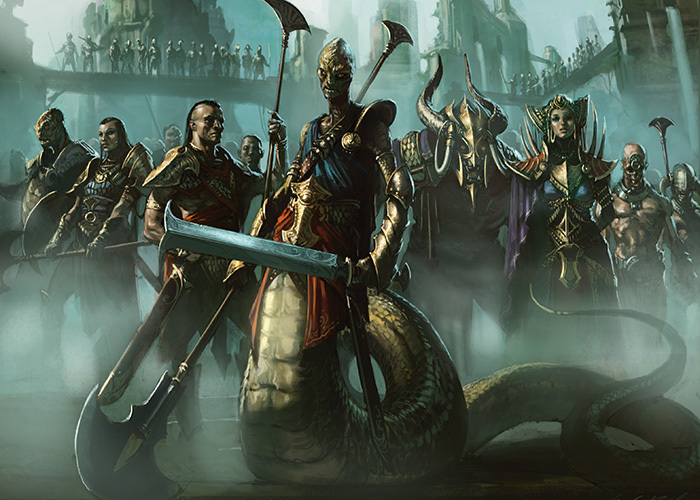 The Sultai are ruled by a lineage of naga. Master propagandists, the naga have claimed dragon ancestry in order to connect their lineage to the power of the ancient dragons, which has given them another psychological advantage over the masses within their subjugated territories. The undead armies of the Sultai come from an assortment of clans and species. The masses in the army are usually just left in the clothing they died in. The undead kept close to the capital city are dressed appropriately in uniforms pleasing to the eye. The bodies of the sibsig zombies are kept well preserved through powerful necromancy, while the rest of the undead army is left to rot. Mages—naga, human, and rakshasa—are usually taught in the Kheru Temple or the Ukud Necropolis. Warriors and assassins—human, zombie, and naga—are usually trained at locations within the Gurmag swamps, the Marang Fortress, or the Sagu Forest. Human merchants called the Panjasi are the traders and dealers of the Sultai. A fair number of them are mages and assassins as well. Zombies are servants throughout the Sultai. The second skin. The Sultai call the creation of undead "the second skin." As a snake sheds its skin and is metaphorically born anew, reviving the dead is seen in the same light. In reality, this is a cruel joke within the naga upper class. They have no respect for the human dead, which is why they treat human dead like chattel and have bodies modified to serve the most mundane tasks. Relics. The Sultai use the dead to cast ritual spells. Body parts are used to conjure, dispel, and assault with magic. Rotting fingers, toes, hands, and feet are often found strung on Sultai mages' necklaces or belts for use in their rituals. Mind control, hypnosis, and the lotus perfume. 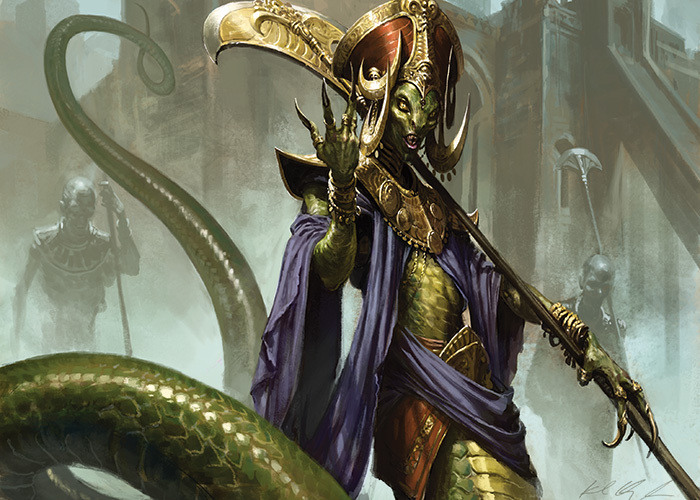 The Sultai naga have the power to hypnotize and charm. They use this to influence deals or outright control others' minds. 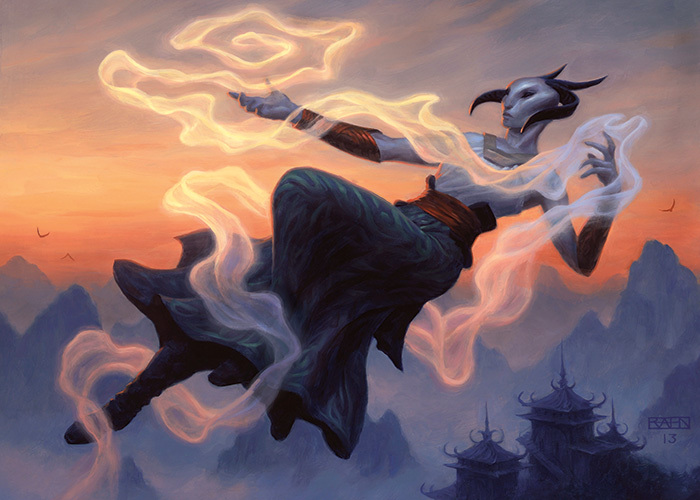 To attain a similar effect, Sultai human mages have to resort to the use of lotus perfume, which causes a dreamlike sleep, paralysis, and—ultimately—death. Naga magic. The magic of the naga is about warping the body, whether through shapeshifting or through modification after necromancy. They loathe humans, who they consider animals on par with their attack baboons. It is said that the naga's cruelty comes from their resentment of the humanity they lost in ancient days. The naga are also versed in powerful venoms and poisons that can kill an elephant with a mere pinprick. Magic of Sultai humans. Their magic consists of elementalism and shamanism. They worship the power of the lands and are secretly attempting to contact their ancestors, who lived in a time when humans ruled the Sultai. Their magic is also based in making themselves more powerful. Strength, growth, and healing magic help them survive the tyranny of their superiors and give them value in the mercantile world of the Sultai. Rakshasa magic. The rakshasas wield the most aggressive and dangerous magic of all the Sultai. It is swirling darkness and powerful spirits of the dead. Their magic is the kind that lays waste to swaths of land or reduces an army to dust. They summon horrors and abominations that swallow cities and devour legions. Queen Sidisi. 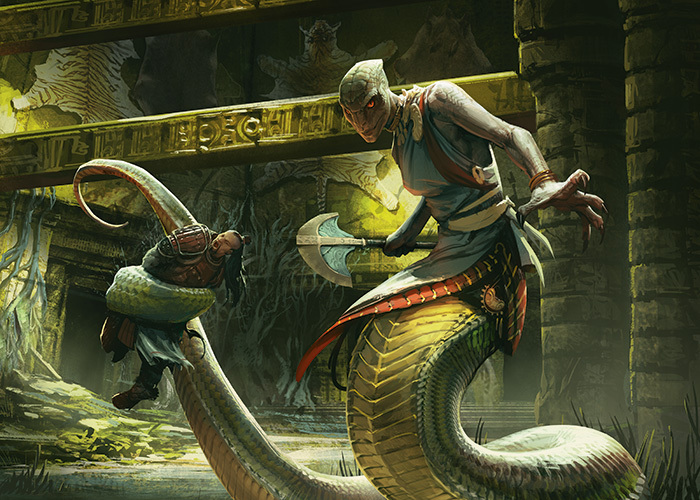 The naga Sidisi is the khan and queen of the Sultai. Her power comes from her inherited wealth and from magic taught to her by the rakshasa. She is haughty, cruel, and crafty, and she is known for simply slaughtering those who would oppose her. In her eyes, death is just a way to increase the power of her undead forces. 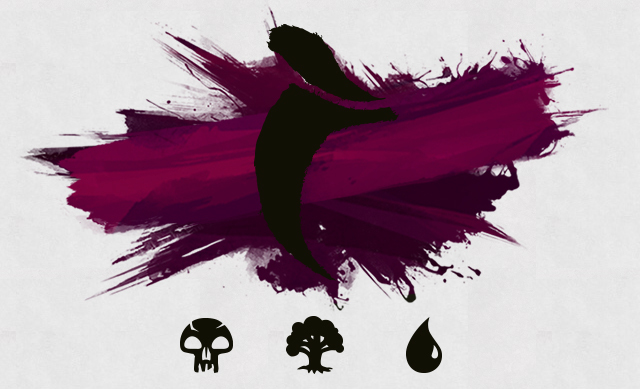 She wishes to reunite the clans of Tarkir into a new empire under a single banner: hers. Sidisi rules from Kheru Temple, deep in a treacherous jungle. Her empire is managed through vast numbers of operatives, both living and dead. She holds court at Qarsi Palace, where the Sultai moor their luxury barges. On these barges, Sidisi dazzles and hypnotizes guests who wish to experience the legendary luxuries of the Sultai, hoping to achieve through trickery what little she cannot achieve through force. "We appreciate the other clans maintaining their lands until such time as we can subjugate them. Their work will be rewarded when they are jewel-adorned servants in our palaces." Feyomsi. This terrifying rakshasa sorcerer and necromancer dwells within the Ukud Necropolis with his group of devoted mages, most of them human. They defend the necropolis with their spells and summoned demons known as sidikur. 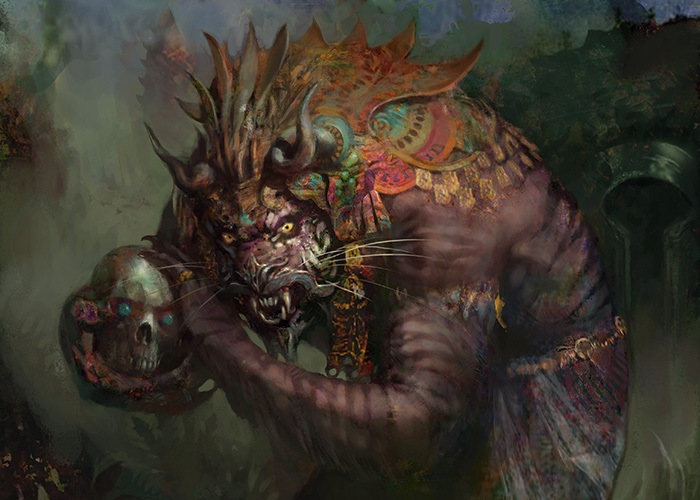 Feyomsi is given a great amount of breadth from Sidisi, as he is the rakshasa chief in giving her dark magic. Taigam. Taigam is a human male who has reached a considerable level of power and influence as Sidisi's minister. Taigam is a powerful mage who studied with the masters of the Jeskai before he sought power within the ranks of the Sultai. Now, he is the ruthless right hand of Sidisi and does her bidding unfailingly. Kirada. A powerful human female mage, Kirada is the custodian of the Qarsi Palace. She runs the place, from the dockside gambling halls to the upper-level pleasure domes. She is a native of the Sagu jungle and was said to be a fierce warrior who was a master of the forest and its secrets before she took on the role of overseer. She is often seen with her trained baboons, who attack anyone at her command. She is also well-versed in various poisons and intoxicants—a valuable skill when wishing to close a deal with a wealthy client or removing a particularly irritating obstacle. The Sultai reside in large city temples, necropoleis, and pleasure palaces that dot their domain. Kheru Temple. Kheru is the name of the central place of worship for the naga and the Sultai. Sidisi does most of her ruling from the Kheru Temple, issuing orders through zombie gangs, canal boats, courier bats, and human servants. She holds court and entertains at the Qarsi Palace in order to dazzle and hypnotize those who wish to expose themselves to the legendary Sultai pleasures. Ukud Necropolis This is the most architecturally impressive building in Sultai lands. It contains the tombs of their ancestors going back hundreds of years. When she needs to consult Feyomsi, Sidisi retreats to Ukud. There, she can draw upon the full power of the Gurmag swamps and learn darker, more powerful rituals from the rakshasa and his followers. Qarsi Palace is a sprawling, luxurious jungle paradise set on the waterways. Pleasure barges are moored here, their colored paper lanterns reflecting off of the water until well into the night. Candle-lit pathways snake far into the jungle, where any kind of pleasure awaits those who seek such realms of abandon. The Gudul are a series of islands that dot the massive river delta. In the waters and on the islands lurk all kinds of monsters and undead abominations that guard the inner waterways from ships and intruders that would dare invade the Sultai's domain. The Gurmag Swamps form a belt of treacherous swampland that encircles part of the Sultai domain. It is riddled with the sibsig, the wandering zombie hordes of the Sultai—an amalgam of fallen soldiers from the other clans of Tarkir. The Marang River Fortress. This is where the jungle meets the mountain range of the Mardu through a small, steep pass. It is here that the snowmelt from the mountains created the great Marang River. The Sultai patrol this place with their most horrendous creatures and terrifying spirits, knowing they are just one error away from being taken over by the Mardu horde. The Sagu. This is the ancestral home of the naga, a vast, lush jungle that is still largely unknown. Many enormous beasts dwell here that are beyond comprehension. Molderfang Falls. A sacred site for the Sultai, Molderfang Falls is where an ancient dragon known as Silumgar was felled and crashed into the river Marang. The dragon was killed by a young and cruel Sultai khan, and the Sultai often make pilgrimages to this site to pay homage to the Sultai's ruthlessness and victory over the dragons. Crocodile Pits. 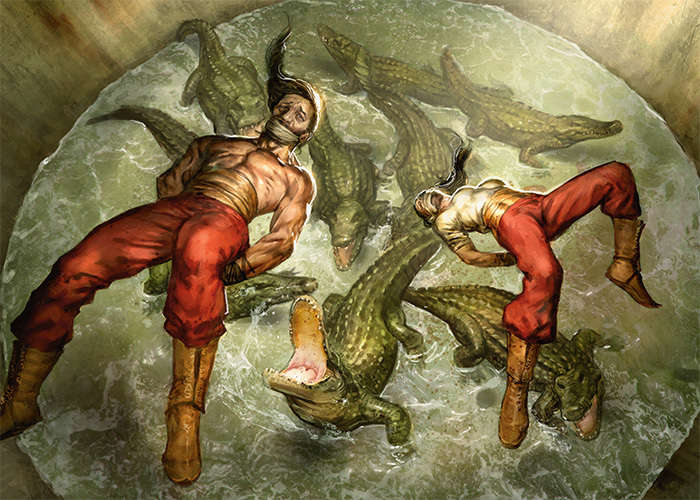 Those who earn the displeasure of the Sultai wind up as afternoon snacks in the crocodile pits. Crocodiles of various species and sizes fill the massive pools that sprawl across the fifty acres of the Pits. Some of the larger crocodiles have been given names and are said to be distant offspring of the mindless dragons of old. Sidikur. Sidikur is the Sultai name for demons. They come in a variety of shapes, sizes, and demeanors—short, squat, and wingless to immensely powerful, huge, and bat-winged. The knowledge of how to call and bind them comes from the rakshasa, who leave out the binding spell in order to coerce more gold from desperate mages, who foolishly summon sidikur without forethought.